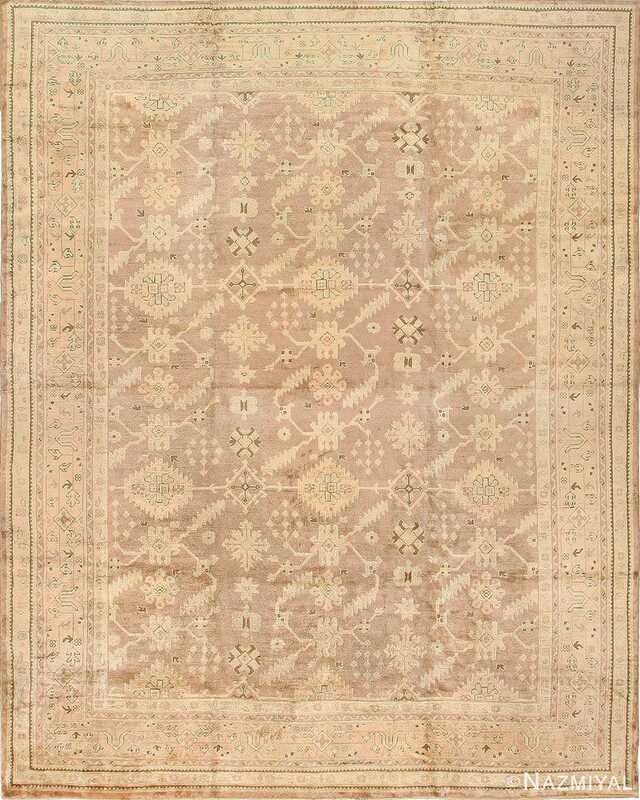 Decorative Antique Ivory Background Turkish Oushak Oriental Rug, Country of Origin / Rug Type: Turkish Rugs, Circa Date: 1900 – Turkish Oushak rugs, such as this fine antique rug relies on a vibrant color palette to establish definition and character within the threading. 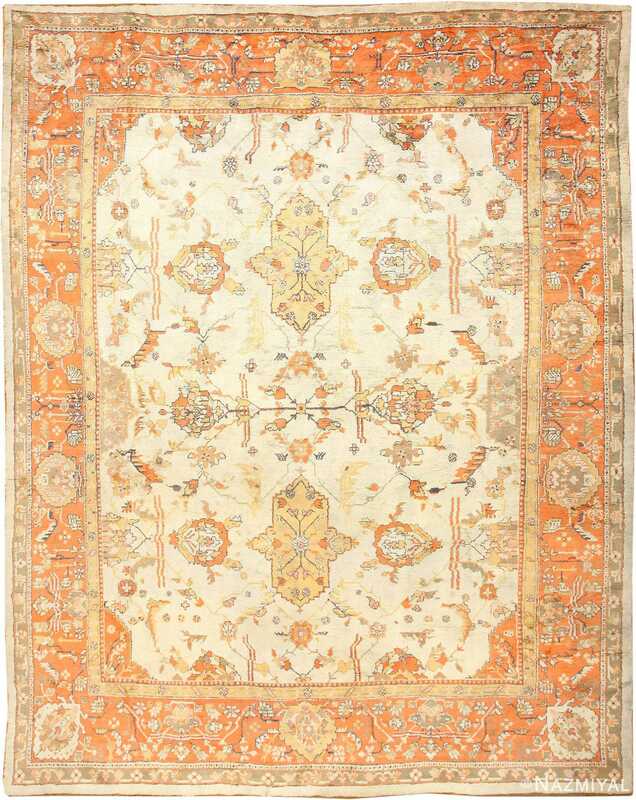 Bright tangerine colors stand out against softer peach hues, and the two unified tones are further grounded amidst soothing beige and dark olive. A rich and vibrant border surrounds the piece, its depths filled with broad fronds and whimsically moving vines, acting as a bridge between the elements present. Between the borders at the core is a much lighter backdrop, standing out to draw attention amidst the gleaming colors surrounding it. Here, the viewer is treated to a floating display of leaves, petals and stems, the display almost dream-like in its presentation, invoking feelings of serenity and wonder. 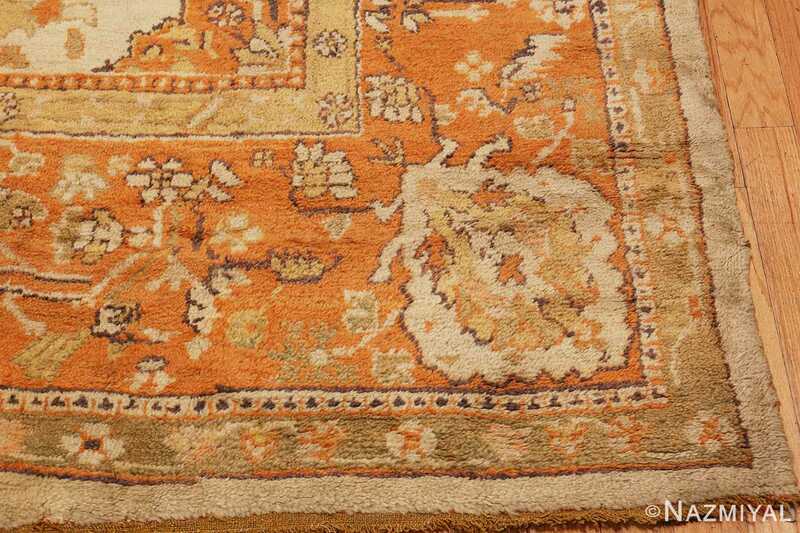 This beautiful Turkish Oushak rug from the turn of the 20th century highlights delightful oranges, earthy browns, and cheerful yellows against an ivory background. This color palette comes together to create a bright, yet harmonious ambiance. This antique Turkish Oushak rug was created in the final days of the great Ottoman Empire. The use of light colors and large scale design patterns reflects the regional tastes of an empire that lasted for over seven centuries. 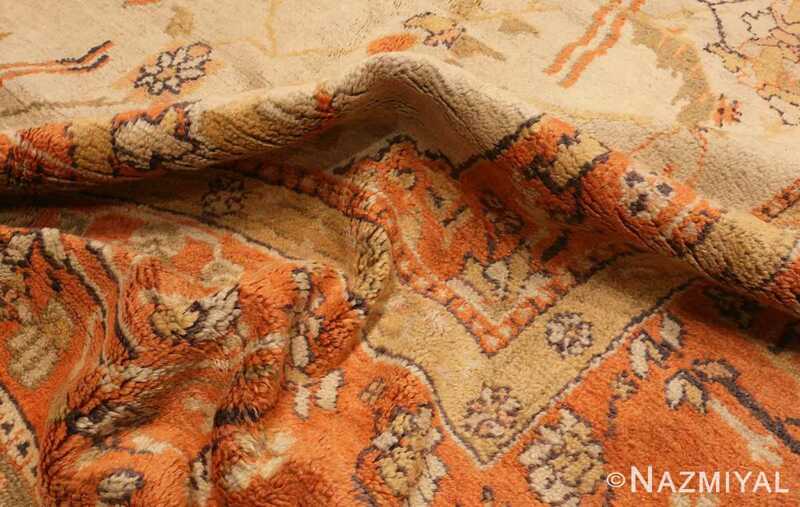 The design of the rug is regal enough to grace the floors of palaces, which was the purpose of these rugs when they were created. 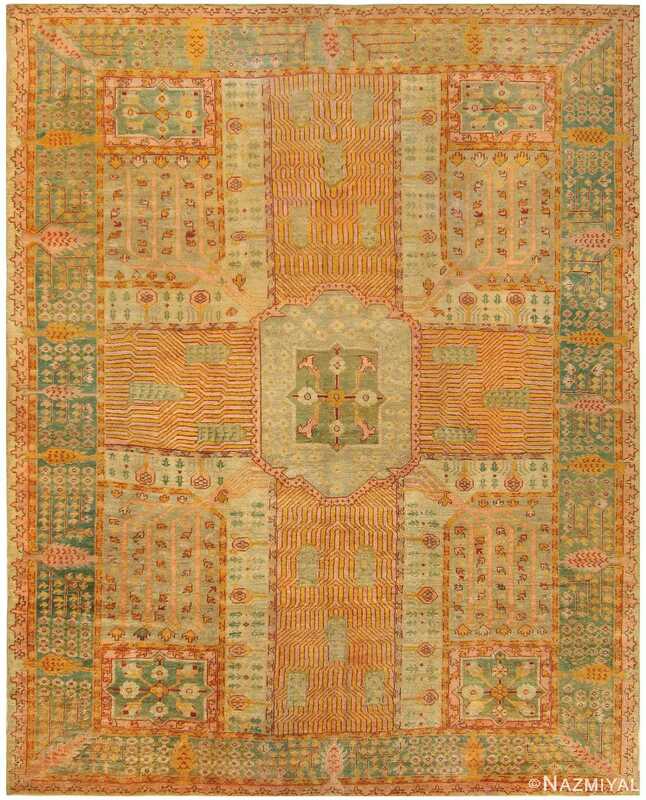 This antique Turkish rug features a recognizable design that uses both horizontal and vertical symmetry to divide the antique Oushak rug into four identical portions. 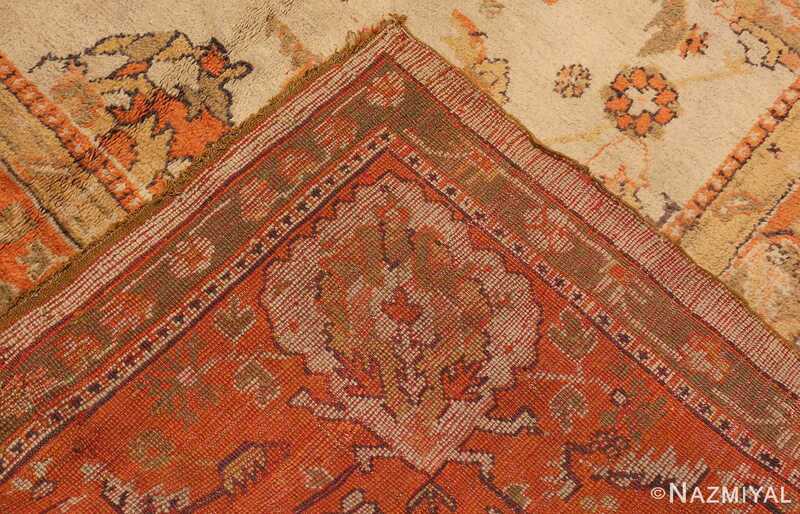 It contains the formal elements that one would expect to find in a rug of this time period. 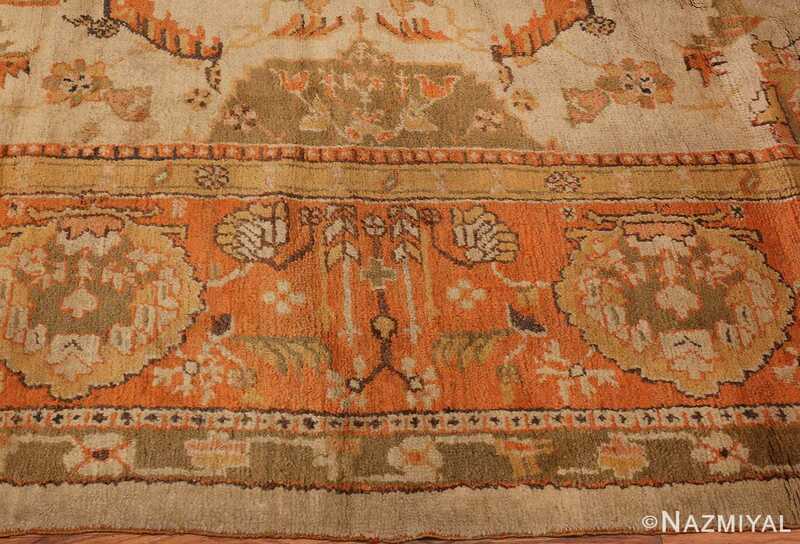 This includes a central medallion, formal corners, a contrasting field, and a complex main border. 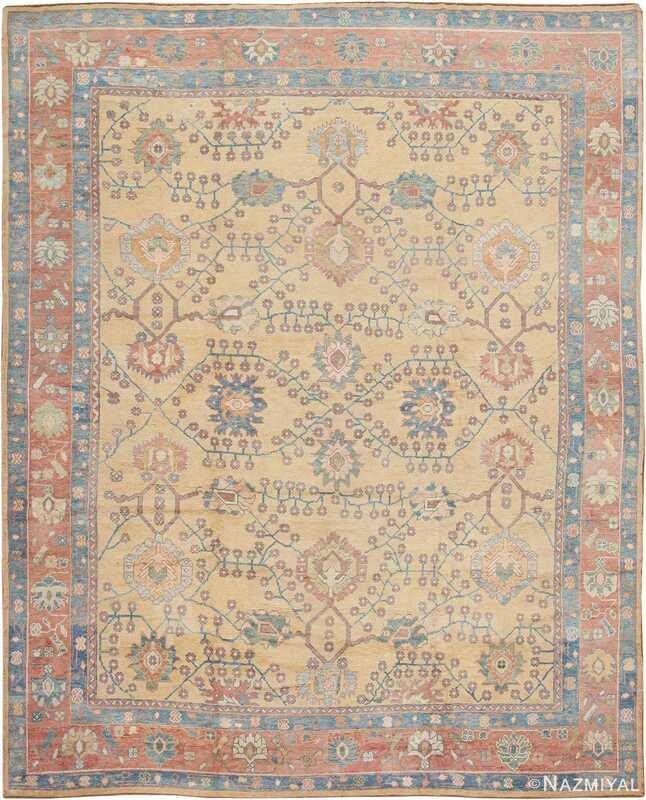 One of the unique features of this Turkish Oushak rug is that the pendants of the rug are emphasized more so than the central medallion. 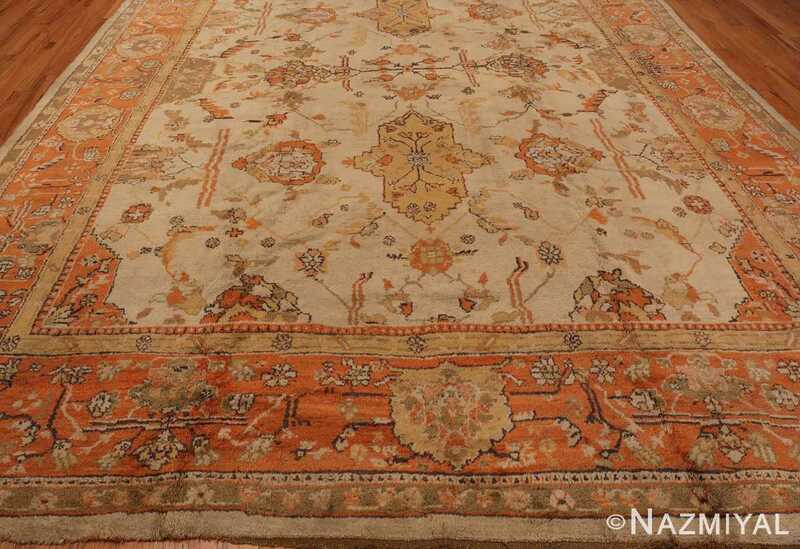 Even though this magnificent and highly decorative antique Turkish Oushak rug does have a central motif, it is understated, when compared to the rest of the design elements. 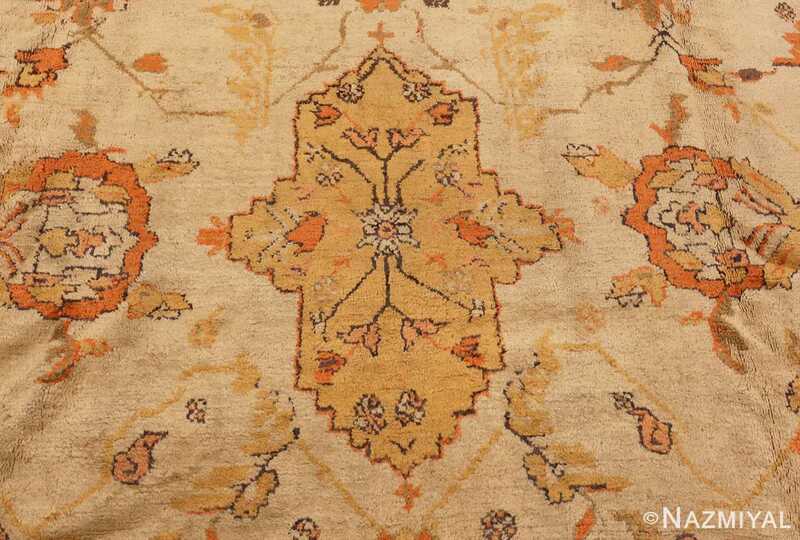 This allows the eye to wander to the many motifs found within the rug, rather than focusing on a single, central design element. 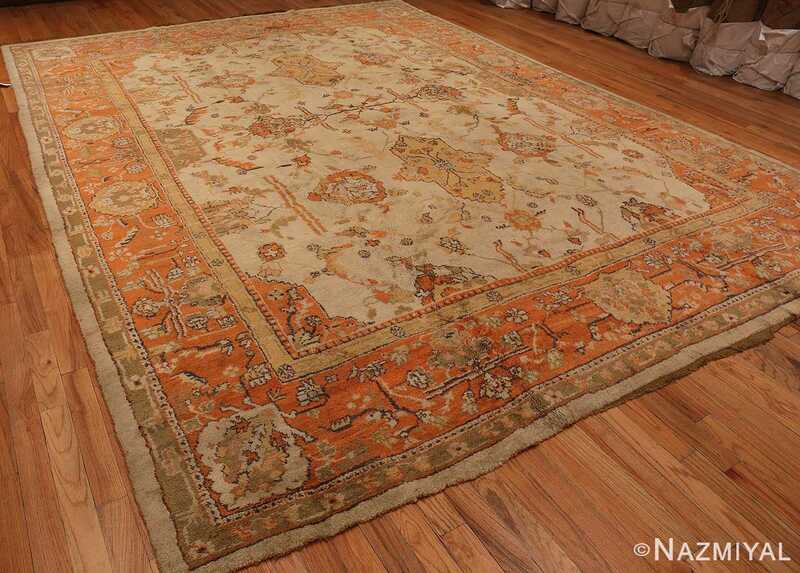 This is a luxurious, traditional antique Ottoman Empire era carpet, with a classic design that could be used in a number of home design schemes. It is the type of antique carpet that would blend well with a more traditional room design, or perhaps add a bit of Bohemian flair. It could also be the focal point and the springboard of a Scandinavian, modern or even minimalist interior design. An allover design of palmettes and whirling tendrils in pale gold repeats across the mauve aubergine field of this elegant antique Oushak from Turkey.